Caecilius est in hortō. 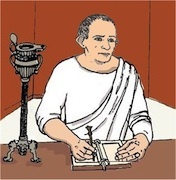 Caecilius in hortō sedet. servus est in ātriō. servus in ātriō labōrat. Metella est in ātriō. Metella in ātriō sedet. īrātus. “pestis! furcifer!” coquus clāmat. Cerberus exit. 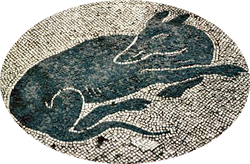 Caecilius had this mosaic of a dog in the doorway of his house. in mēnsā on the table pestis! pest! Metella est māter. 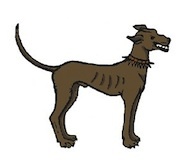 canis est in viā. Metella is the mother. 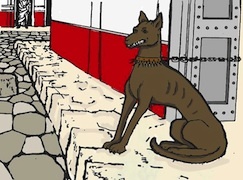 The dog is in the street. The dog is sleeping in the street. The slave is working in the kitchen. translation gives the better sense. 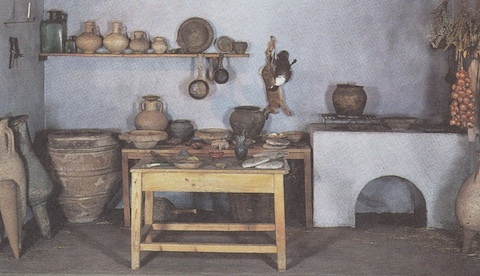 Reconstruction of a Roman kitchen. For example:	. . . . . est in hortō. The slave is in the garden. A1	. . . . . est in hortō. 2	. . . . . est in viā. 3	. . . . . est in culīnā. 4	. . . . . est in tablīnō. 5	. . . . . est in ātriō. 6	. . . . . est in triclīniō. B1	Clēmēns . . . . . labōrat. 2	Caecilius . . . . . scrībit. 3	canis . . . . . lātrat. 4	Metella . . . . . stat. 5	coquus est . . . . . .
6	Quīntus est . . . . . .
Caecilius lived in Italy during the first century A.D. in the town of Pompeii. 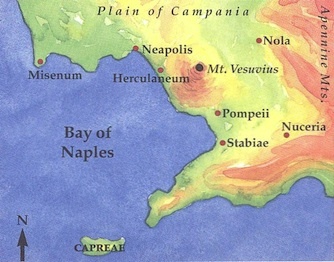 The town was situated at the foot of Mount Vesuvius on the coast of the Bay of Naples and may have had a population of about 10,000. 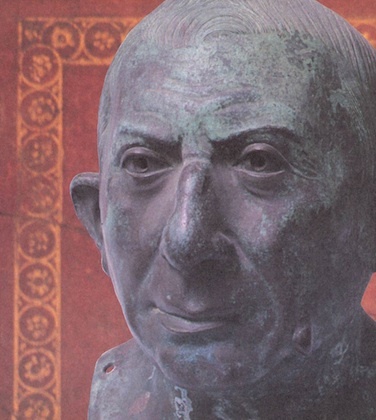 Caecilius was a rich Pompeian banker. 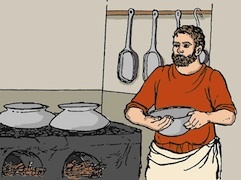 When archaeologists excavated his house, they discovered his accounts in a strongbox; these documents tell us that he was also an auctioneer, tax collector, farmer, and moneylender. 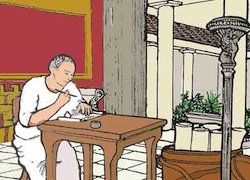 He inherited some of his money from his father, Lucius Caecilius Felix, but he probably made most of it through shrewd and energetic business activities. He dealt in slaves, cloth, timber, and property. He also ran a cleaning and dyeing business, grazed sheep and cattle on pastures outside the town, and sometimes won the contract for collecting the local taxes. He may have owned a few shops as well and probably lent money to local shipping companies wishing to trade with countries overseas. The profit on such trading was often very large. Caecilius’ full name was Lucius Caecilius Iucundus. Lucius was his personal name, rather like a modern first name. 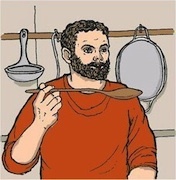 His second name, Caecilius, shows that he was a member of the “clan” of the Caecilii. Clans or groups of families were very important and strong feelings of loyalty existed within them. 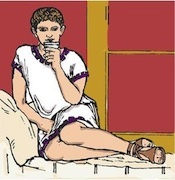 Caecilius’ third name, Iucundus, is the name of his own family and close relatives. The word Iucundus means “pleasant,” just as in English we find surnames like Pleasance or Jolly. Only a Roman citizen would have three names. 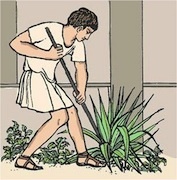 A slave would have just one, such as Clemens or Grumio. As a Roman citizen, Caecilius not only had the right to vote in elections but also was fully protected by the law against unjust treatment. The slaves who lived and worked in his house and in his businesses had no rights of their own. They were his property, and he could treat them as well or as badly as he wished. There was one important exception to this rule: the law did not allow a master to put a slave to death without showing good reason. through the holes at the top. Caecilius kept his tablets and money in a wood and metal strongbox like this. auction of a slave for 6,252 sesterces. 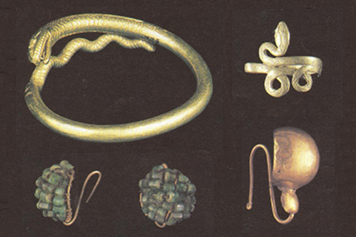 Roman women of all classes had much greater personal freedom than women in other parts of the Mediterranean. 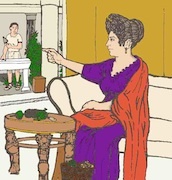 Caecilius’ wife, Metella, like many Roman wives and mothers, had an important position in her home. She was responsible for the efficient and economical management of the household. She supervised the work of the domestic slaves. In order to run the house successfully, she would need to be well organized and firm but sensitive in her control of the slaves. Although complete equality of the sexes was never an issue in ancient Rome, the Roman wife often had considerable power, influence, and freedom of behavior. She enjoyed her husband’s confidence; she was his companion and helper; she shared his authority over the children and slaves; she shared responsibility for the religious cult of the family; she prepared for social occasions and helped to welcome guests; she dined next to her husband at banquets (a practice Greeks would have condemned as disgraceful); she played a part in his career if it took him on a tour of duty to the provinces. Unlike women in Greece or the Near East, Roman women were not required to live in seclusion in the home. 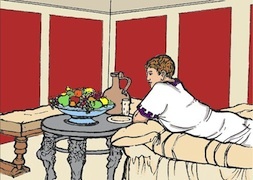 Although their lives did center on the home, Roman women of all classes went out to shop, to exchange visits with friends, to go to the baths, to worship at temples, to attend public events in the theater or amphitheater, and to accompany their husbands to banquets where they took a well- informed part in social and literary conversation. We know of women who were cooks, bakers, weavers, hairdressers, shoemakers, silversmiths, midwives, and doctors. Occasionally women engaged in business. Often such women were widows who took over control of their husbands’ affairs. One influential Pompeian businesswoman was Eumachia (right), a public priestess and patroness of the powerful clothworkers and merchants. She inherited money from her father, who had owned a brickmaking business. 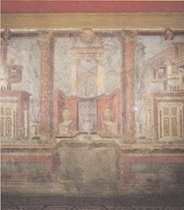 It was her donation of money that built the large meeting hall of the cloth trade in Pompeii. 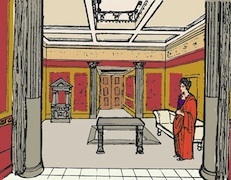 Eumachia, a Pompeian businesswoman who built the Clothworkers’ Meeting Hall in the forum. 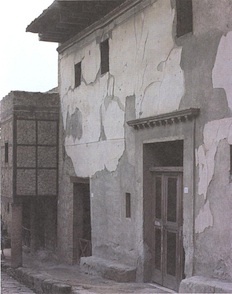 The town house in which a wealthy man like Caecilius lived differed in several ways from an equivalent house today. The house came right up to the sidewalk; there was no garden or grass in front of it. The windows were few, small, and placed fairly high. They were intended to let in light but to keep out the heat of the sun. Large windows would have made the rooms uncomfortably hot in summer and cold in winter. Some houses stood only one story high; others had a second floor. On either side of the front door, many houses had shops, which were rented out by the owner of the house. From the outside, with its few windows and high walls, the house did not look very attractive or inviting. The ground plan of the house shows two parts or areas of about equal size. They look like courtyards surrounded by rooms opening off the central space. The main entrance to the house was on the side facing the street. On passing through the door, the iānua, the visitor came into a short corridor which led directly into the main room, the ātrium. This impressive room was used for important family occasions and for receiving visitors. In the middle, the roof sloped down slightly towards a large square opening called the compluvium. Air and light streamed in through this opening, high overhead. 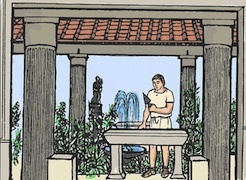 Immediately below was the impluvium, a marble-lined, shallow rectangular pool that collected rainwater, which was then stored in a cistern for household use. One of the most striking things about the atrium was the sense of space. The high roof with the glimpse of the sky through the central opening, the large floor area, and the absence of much furnishing all helped to give this impression. The furniture would include a bronze or marble table, a couch, and perhaps a strongbox in which the family valuables were stored. 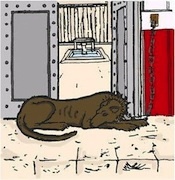 In a corner, near the main door, there was the larārium, a small shrine at which the family gods were worshipped. 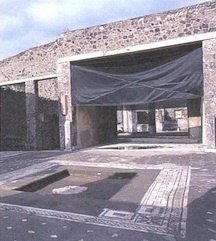 The floor of the atrium was paved with marble slabs or with mosaics. The walls were decorated with panels of brightly painted plaster. 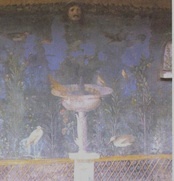 The Pompeians were especially fond of red, orange, and blue. On many of these panels there were scenes from well-known stories, especially the Greek myths. Around the atrium were arranged the bedrooms, the study, and the dining room. The entrances to these rooms were usually provided not with a wooden door but with a heavy curtain. tablinum and the sunlit peristylium. From this first area of the house, the visitor walked either through the tablīnum (study) or through a narrow passage into the second part. 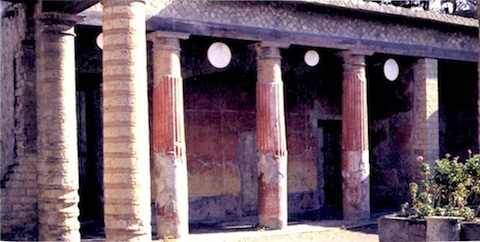 This was the peristȳlium, which was made up of a colonnade of pillars surrounding the hortus (garden). 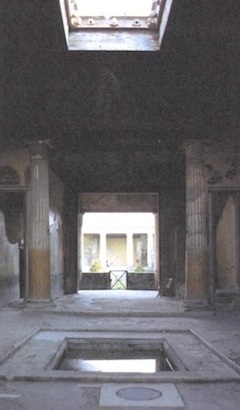 Like the atrium, the colonnade was often elaborately decorated. Around the outside of the colonnade were the summer dining room, the kitchen, the toilet, slaves’ quarters, and storage rooms. Some houses even had their own set of baths. The garden was laid out with flowers and shrubs in a careful plan. In the small fishpond in the middle, a fountain threw up a jet of water. Marble statues of gods and heroes stood here and there. In the peristylium, the members of the family enjoyed the sunshine or shade as they wished; here they relaxed on their own or entertained their guests. 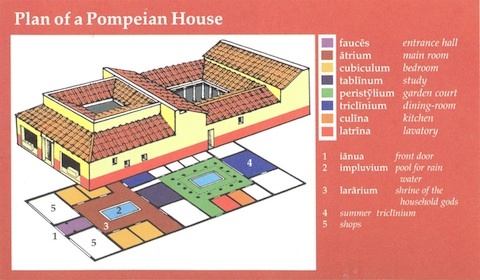 The Pompeians not only lived in houses that looked very different from modern ones but also thought very differently about them. They did not expect their houses to be private places restricted to the family and close friends. Instead, the master conducted much of his business and social life from home. He would receive and do business with most visitors in the atrium. The more important ones would be invited into the tablinum. Certain very close business friends and high-ranking individuals would receive invitations to dine in the triclīnium or relax in the peristylium with the family. Only the wealthy lived like this; poor people lived in much simpler homes. Some of the poorer shopkeepers would have had only a room or two above their shops. In large cities, such as Rome, many people lived in īnsulae, apartment buildings several stories high, some of them in very poor condition. A peristylium with hanging ornaments between the columns. 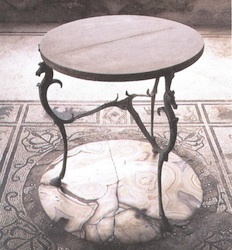 Three-legged table in the tablinum of the House of Paquius Proculus. be working on the accounts.